This card is very simple and easy to make even with limited supplies. I used 3 fabric flowers, a butterfly image from old biology book, and I traced it on 3 different coloured card stock, and then cut it with scissors. 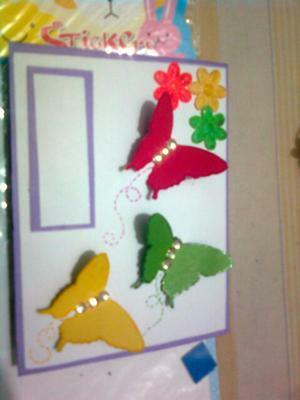 Then on purple card stock I pasted a piece of white cardstock, and in the end I pasted the butterflies, beads and flowers. Your card size depends on your choice. Making use of odd bits can produce some wonderful cards, and you don't need any special equipment to make them. Follow Sabahats lead and make the butterflies from scraps of fabric, card or paper, in bright and zingy colours and add them to your designs. The gemstones for the body are a neat touch and of course every butterfly leaves it's trail. The simple technique of Matting and Layering can be used to make the most of other leftover pieces of card. You will find the information to acieve this in the Techniques" section in the NavBar to your left. A sentiment for any occassion can be added and don't forget to add ...."Handmade by ...." on the back of your creation. Your card maybe simple but it is very effective & cleverly done.